While the holidays can be a time for cuddling up in front of the fire with a book and a mug of hot chocolate, in the Wood River Valley there are always plenty of options for outdoor activities, ranging from trying a new snow sport to spending the night in a backcountry yurt. For those looking to spend the night surrounded by stars and mountains, three local outfitters offer winter yurt rentals. Yurts are Mongolian-style tents, temporary structures located away from the hustle and bustle of the ski areas and day lodges. Usually, these huts are heated with wood stoves, feature outhouse bathrooms and rely on the renter’s ability to get there by skiing or snowshoeing. The yurts are open for reservations all season long, and are mostly used by backcountry skiers looking for fresh powder and new terrain. Sun Valley Trekking has six such huts, which only require renters to pack in a sleeping bag and food. Company owner Joe St. Onge said those who want a completely guided yurt stay can purchase a package that includes guide services, food and a porter to carry gear. Unguided stays are also available, but St. Onge said first-time yurt users are required to at least have a guide show them out to the yurt and give an update on nearby snow stability conditions. He said custom packages are available, depending on the needs of the group. St. Onge said most groups choose to spend two to three nights in the huts, with daylight hours spent powder skiing. “It gives them plenty of time to ski and explore,” he said. Sawtooth Mountain Guides, based in Stanley, offers similar services for its Williams Peak Hut, built in 1986 by Sawtooth Mountain Guides founder Kirk Bachman. Guide Chris Lundy said both guided and unguided stays are available, along with avalanche education classes. Galena Lodge has three yurts, located 24 miles north of Ketchum, which are easily accessible to cross-country skiers and snowshoers using trails at the lodge. Rates and services vary. 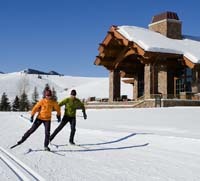 Sun Valley Co. offers alpine skiing lessons on Dollar and Bald mountains and Nordic skiing instruction at the Nordic Center on Trail Creek Road. Group Nordic lessons for beginning kids and adults are offered, as well as private lessons and clinics designed to help skate and classic skiers bring their skills to the next level. Gear is available to rent with all lessons. The Blaine County Recreation District also offers private, semi-private and custom group cross-country lessons for adults and kids at the new Croy Nordic center east of Hailey and at Galena Lodge. Equipment rentals are available. Self-guided snowshoeing outings are also offered. For those who are happy with their snow-sport skills, there are always the sleigh rides at Sun Valley. A horse-drawn sleigh leaves the Sun Valley Inn at 6 p.m. and take riders past the Nordic Center to Trail Creek Cabin, where dinner and drinks are served. Sun Valley Co. spokesman Jack Sibbach said sleigh rides are scheduled to start Thursday, Dec. 20. Tubing and sledding at Sun Valley Resort is set to start shortly, Sibbach said, though the opening date depends on snow. “I don’t know if that means [this] week or for Christmas, but there will be a tubing experience at the base of River Run,” he said. The location has moved from Dollar Mountain to the River Run base of Bald Mountain this year. Sun Valley Nordic Center: 622-2250. Sun Valley Trail Rides: 622-2135. Sun valley Snowsports School: 622-2289.